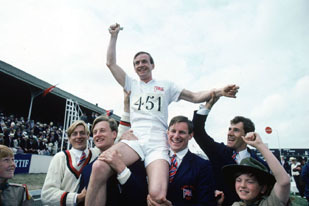 At the core of the film is a religious struggle running miles in the minds of the two leads: the fearless but pious Scot, Eric Liddell (Ian Charleson) and the brusque Jewish Englishman, Harold M. Abrahams (Ben Cross). Liddell, the resident choir boy of the steam-ship heading for the Paris Olympics, pushes himself to run in order to connect with God (“To win is to honor Him,” he says), while Abrahams uses his physical skills as a “weapon” to defeat an increasingly anti-Semitic Europe. Cowed by the enormity of the international games, the two fastest wings of the United Kingdom, “rivals under the same flag” as one colleague puts it, must first bury their personal differences and inner demons before uniting under a victorious Union Jack. What’s striking about this most unorthodox of sports film is its comfortably formulaic pace: budding young athletes discovering athletic aptitude in civilian life, swift grooming in University and the Church, qualifying rounds that mesh the band of brothers together, troubles with the ladies before setting sail and the ultimate prize of Olympic glory in the lush backdrop of swinging Paris. Between the rigid confines of that structure are moments of grace. The dashing, Plimpton-esque Lord Andrew Lindsay (Nigel Havers), later a gracious bronze winner, doesn’t just run hurdles at his stately practice course — he uses glasses of freshly-popped champaign placed atop the hurdles to indicate any soft-shoe infringements. When Italian trainer and guru of the racetrack — “the clearest-thinking athletics coach in the country” — Sam Mussabini (portrayed by the consummate “actor’s actor,” Ian Holm) studies Abraham’s skill on the track (and finally succumbs to his urgings to help him improve his paces) he agrees by saying nothing more than, “I can find you another two yards.” The succinct but commanding statement is then followed by an eloquent training montage set to the thumping keystrokes of Vangelis, and, inch-by-inch (literally), Abrahams pulls even with the natural-born talents of Liddell through basic, old-fashioned sweat and tears (skipping the blood, of course).